The summary meaning of depreciation: It is an expense that reduces the cost of assets (high cost equipment), in annual installments, over their life-span, using different methods. Tax laws don't allow the full cost to be included in the bookkeeping accounts as an expense immediately upon purchase. The cost has to be spread over several years. You don’t have to know how to calculate depreciation, but it will benefit you to know the meaning of depreciation and how it affects your small business. 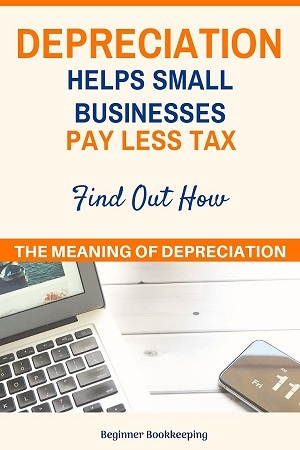 This page explains how depreciation reduces your tax liability and why it is done this way. Depreciation is a deductible business expense. It reduces the cost of fixed assets by percentages over several years. It lowers your tax payments. It has to be tracked in a schedule. The purchase price of a fixed asset is not allowed as an immediate deductible business expense, unless it is under a certain cost (see next section Asset Value Limits). This means you cannot immediately enter the full cost as an expense in your bookkeeping accounts to show on your Profit and Loss. This is because an asset has a long-term benefit to a business, so rather than claiming the full expense immediately in the year it is purchased, the tax laws require the cost to be spread over the perceived life of the asset which could be from 2 years to 10 or more years. An asset can potentially help a business bring in income over many years, therefore it makes sense for the cost of the asset to be spread over many years too, which aligns with the accounting principle of matching expenses to income within the same time frame as each other. The value of the asset will decline with use and wear over the years and so depreciation aims to reflect that decline in the accounts via the reduction of the cost over the years too. So instead of claiming this year the full purchase price of the asset by entering it as an expense, only a percentage of that price is entered as an expense (the depreciation) and this same percentage is used each year to reduce the cost until the asset is no longer of value. If a business claims this year the full cost of an asset, which could be thousands of Dollars or Pounds or Euros (wherever you are from) it will have a huge impact on the current year’s profit, perhaps even showing a loss, which does not give a realistic picture of the day to day trading of the business – these large one-off purchases are not a regular operating expense. When equipment is expensed it is entered on the Profit and Loss as an expense with its full value. When equipment is capitalized it is entered on the Balance Sheet as an asset – then depreciated by annual portions of its full value. How do you know when a purchase is a fixed asset and not an expense? In most cases, if the cost of equipment (like a printer) falls under a set value limit, it does not have to be depreciated but can be claimed in full as an expense in the current financial year. However, if the cost of an asset is over the value limit (like a new vehicle), and if it will last longer than 12 months, it must be capitalized and then depreciated. Here are some examples of value limits. In America you can be up to $2,500 before having to capitalize the equipment. how often must depreciation be calculated? It can be calculated every month or every quarter, or up to once a year. It must be done no less than once a year .. so you can’t wait two years and then do it. 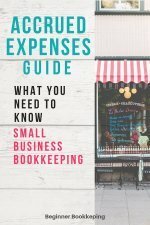 Most businesses will not include depreciation in their monthly bookkeeping because of how complicated it can be but will instead leave it until the end of the year for their Tax Accountant to calculate and include in the end of year accounts. This is perfectly acceptable. The Accountant will multiply the asset value by the percentage and enter that into the accounts. Some Bookkeeping programs (like Xero) make it easier for your Bookkeeper to calculate the depreciation on a monthly basis but adjustments may still be required by the Tax Accountant at the end of the year to get it 100% correct. The Bookkeeper will multiply the asset value by the percentage, and then divide that by the number of months, and the result entered to the accounts. The benefit of including depreciation monthly is to get a more accurate Profit and Loss result which is great for budgeting and cash flow forecasting. should a business owner calculate depreciation? If your business doesn’t own or buy any high cost equipment (or up to the value limits mentioned above), then you won’t require depreciation to be calculated! Bet you’re relieved about that! If you use a professional Bookkeeper to prepare your monthly accounts, they may be able to include the depreciation into your reports. Ask them if it’s something they can do if you want a more accurate estimate of what your profit result will be at the end of the year. At the very least, your Tax Accountant should prepare the depreciation calculations at the end of the tax year before telling you how much tax you must pay. Methods: There are different methods of depreciation available. Residual value: Some assets have a residual or salvage value (the estimated value at the end of its useful life). Pooling: Some assets can be ‘pooled’ (grouped) and then depreciated as a group. Schedule: A specialized report must be prepared to show the depreciation calculations on each asset and the ending book value for the year. Your tax department will have a list of Depreciation Classes or Rates applicable to each type of asset, and the standard life span of various types of assets. Also, a business can use different depreciation methods on different assets within the business; it is not necessary to use the same method for every asset. If you are keen to do the calculations yourself (even if it’s just for estimation purposes) you can always find out what you should do to get your depreciation as close to being right as you can – and then get an Accountant to check it at the end of the year. what is residual or salvage value? This is the expected value of the asset at the end of its useful life and is the amount a business may expect to receive when disposing the asset either by selling it or scrapping it. Smaller valued assets don’t need to have a residual value applied (so they end up with a $0.00 value) which reduces the complexity of depreciation, but larger ones, such as a company vehicle can have a residual value which is the amount the business may be able to sell it for after its useful life; this useful life could be 7 years. In these instances, depreciation must only be calculated on the result of deducting the residual value off the cost price. Example: Cost $25,000 minus Residual value $4,000, result = $21,000. Depreciation is calculated on the $21,000 not the $25,000. Group depreciation can be used for assets that are very similar and would each be depreciated in the same way as each other if done individually – for example a bunch of computers. Each computer is ‘pooled’ with the others into one group and the group is depreciated instead of the individual computers. Straight-line method: the depreciation amount is calculated on the cost price of the asset and reduces in equal annual installments through-out the life of the asset, except the last year may be a different amount depending how much value is left to depreciate. 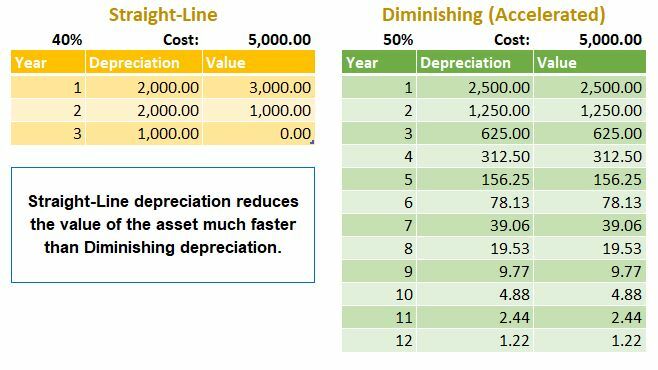 Diminishing* method: the depreciation amount is calculated on the book value of the asset and reduces with decreasing annual amounts. This allows the depreciation expense to be bigger in the first few years and it takes longer to reduce down the book value. Here is a side-by-side comparison showing the affect on the book value of these two types of depreciation on a $5,000 asset. Depreciation amounts do not go directly into the asset accounts because the original cost of each asset must not show a decrease on the Balance Sheet. Depreciation must be shown underneath in a new line as separate and negative values. 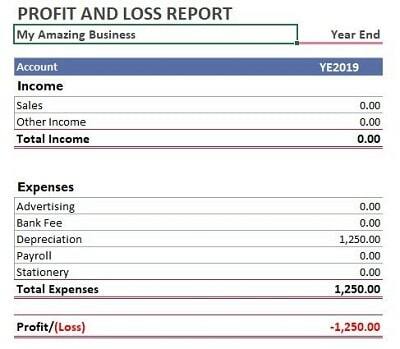 On the Profit and Loss report the account that is affected is just the one account called Depreciation which is listed in the Expenses section. The meaning of accumulated depreciation is the build-up of the depreciation amounts from year to year. If in year one Depreciation on a vehicle was $800 and in year two it was $800, the accumulated amount for those two years is $1,600. The book value is simply the current remaining value of the asset after accumulated depreciation has been deducted. Margie buys a desktop computer for her business for $2,500. Let’s say her computer has a potential life-span of two years. Enter the cost of $2,500 onto the Balance Sheet into Office Equipment, so it is out of the way and doesn’t affect her profit. She finds out that her tax department views computers as having a life-span of 2 years and has set the depreciation rate as 50% per year using the straight-line method. At the end of the year, she calculates the Depreciation by multiplying $2,500 by 50% resulting in a Depreciation amount of $1,250. 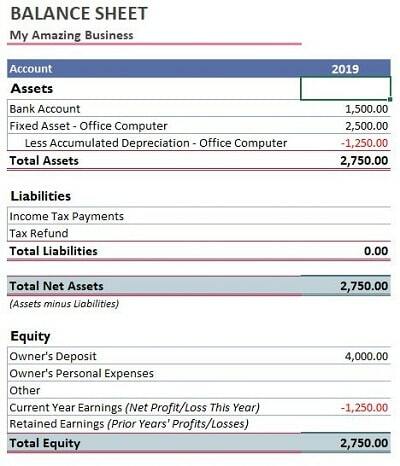 She enters this Depreciation amount of $1,250 into her accounts records as an Expense, thereby reducing her profit by $1,250. She also enters this Depreciation amount onto the Balance Sheet into the Accumulated Depreciation account as $1,250. The remaining cost or book value of the Computer at the end of year one is $1,250. At the end of year 2, it is $0.00. Here are examples of the Profit and Loss Report and the Balance Sheet showing the treatment of Margie's depreciation. Using Margie’s figures above, here is what a basic Depreciation schedule looks like using the straight-line method. This Depreciation schedule report cannot be found in every bookkeeping software program. 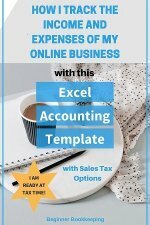 Often, an Accountant or Bookkeeper may have to prepare one manually in Excel. The schedule will be displayed according to the type of depreciation method used. Here is a wrap-up of what we have covered. Depreciation only applies to asset purchases. Depreciation spreads the value of an asset over several years using percentages to calculate the depreciation amounts and using different methods of application. It is not imperative to have depreciation included in the accounts or reports on a monthly basis, so it can be left out until the end of the year for the Tax Accountant to calculate. 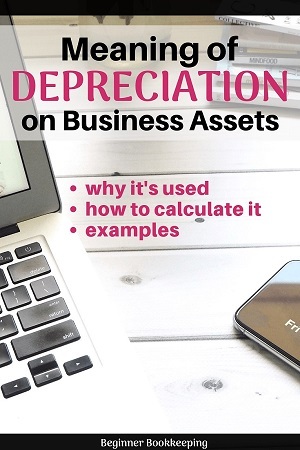 Depreciation accumulates year after year until the value of the asset reaches it’s ending balance (salvage value or zero value) upon which time the business can sell or scrap the asset. A depreciation schedule is used to track the annual calculations and application of depreciation against the assets, the depreciation methods used, and the remaining value of all assets. If you don’t buy high cost equipment, vehicles or machinery, you can ignore depreciation altogether.